Among the corpus of Islamic medical texts there are few which specially connect medicine and religious law (fiqh). These are the forms of treatment mentioned in basic Islamic texts of the Qur’an and Sunnah. 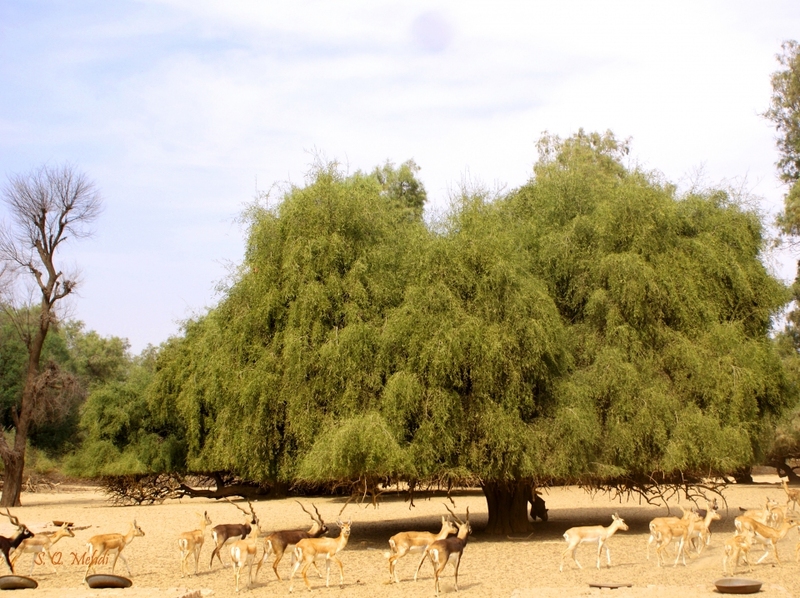 One of them is the usage of Siwak or Miswak, a teeth cleaning twig usually made from the arak tree (Salvadora Persica). “The toothstick is cleansing for the mouth and pleasing to the Lord”, says one of the ahadeeth from the al-Bukhari collection. As a rule, it was used before going to congregational prayer, just after the ritual abolition. 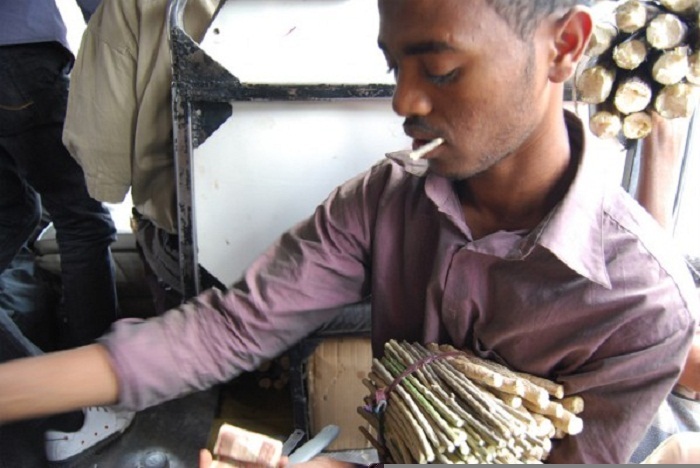 Today, Siwak can be purchased in almost every market, amongst Muslims, in the Middle East or the West. 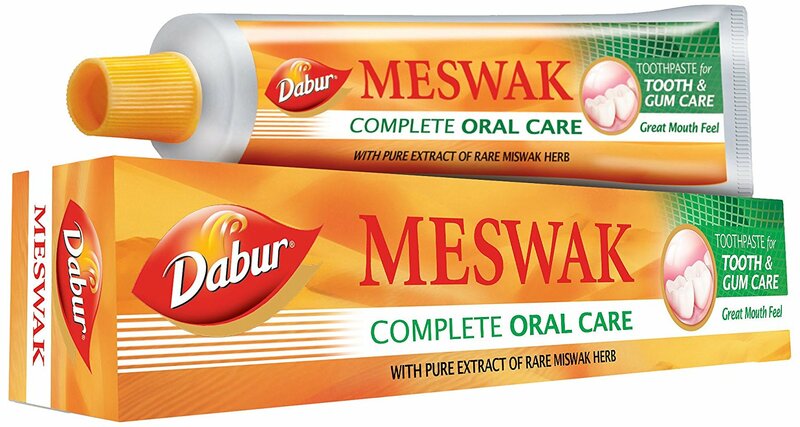 The texts providing rules for general dental care already existed in the “Golden Age” of Islamic medical scholarship, which there are a few treatises dedicated specially to the issue of Siwak, virtues of its usage and other benefits. Among the oldest texts, addressing the subject, there is one by Yuhanna ibn Masawayh (d. 854) and Hunayn b. Ishaq (d. 873). Numerous contemporary studies confirm that the Salvadora Persica plant and its extracts exert beneficial effects on oral tissues and help to maintain good oral hygiene. Most of the oldest Muslim treatises on Siwak remain in a manuscript form. However, similar works on this issue have also appeared in later periods. The newest manuscript (still unpublished), which is going to be analyzed in this article, is written by the great Ottoman encyclopedist, Muhammad bin Mustafa al-Aqkirmani (d. 1760). Not so much is known about this scholar, but nevertheless more than 40 texts produced by him are preserved (and few of them even published, mostly dedicated to Islamic theology and logic). He was born in the city of Aqkirman (or Akkerman), now known as Bilhorod-Dnistrovs’kyi in the Odessa region of Ukraine. In the time between 1484 and 1812, this part of present-day Ukraine was under the rule of the Ottomans with an ethnically mixed population (Ukrainians, Romanians, Tatars, Nogais, Armenian, Jews and others). Born around 1700, Muhammad bin Mustafa al-Aqkirmani started his career in his homeland and then traveled to Istanbul. We do not know exactly where he studied, but since 1737 he was in office as a judge, starting from Izmir, and then going to Cairo, and finally, Makkah. He died in Makkah, in 1760, having been a chief Hanafi judge in the Holy City. 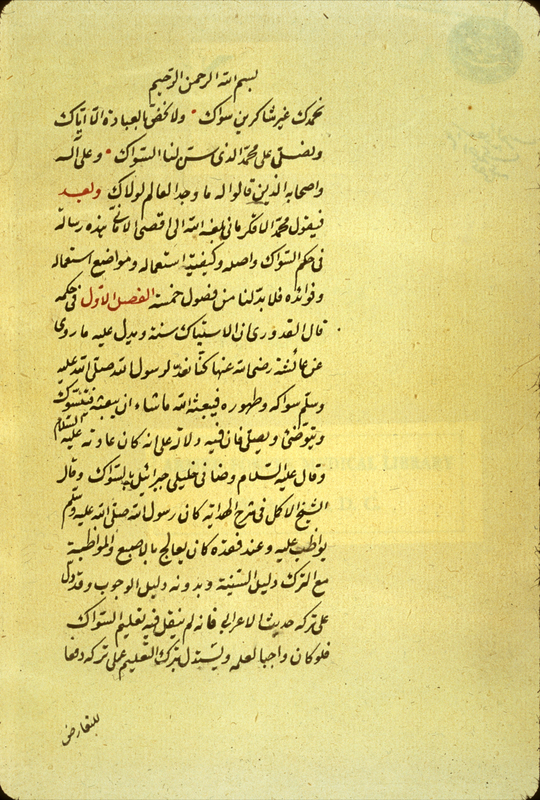 Most of the works written by Muhammad al-Aqkirmani are glosses and commentaries to the treatises of the past (hawwashi and shuruh, as it was typical for his time); however, he authored few “independent” treatises like the work on the infinity of divine knowledge (Al-’Iqd al-Laali fi bayan ‘an ‘ilmuhu Ta’ala gayra mutanahi) and copious bio-bibliographical work “Definitions of the Sciences and Descriptions of the Authors” (Ta’arifat al-Funun wa Manakib al-Musannifin). Among other texts, there is a small treatise entitled “Risalah fi hukm al-Siwak”. One of the copies preserved, is located in the National Library of Medicine (Washington D. C., USA). Written in Arabic, it contains just 4 leaves with dimensions 20.5 x 12.8 (text area 14 x 5.7) cm and 19 lines per page. The title is given on fol. 1b line 6 as Risalah fi hukm al-siwak. The author's name given on line 5 of fol. 1b as Muhammad al-Aqkirmani (fa-yaqul Muḥammad al-Āqkirmānī…). Unfortunately, the copy is undated and unsigned, but the appearance of the paper, ink, and script suggests late of 18th century. There are some marginal annotations, possibly in the same hand as the unnamed copyist. The volume consists of 4 leaves. 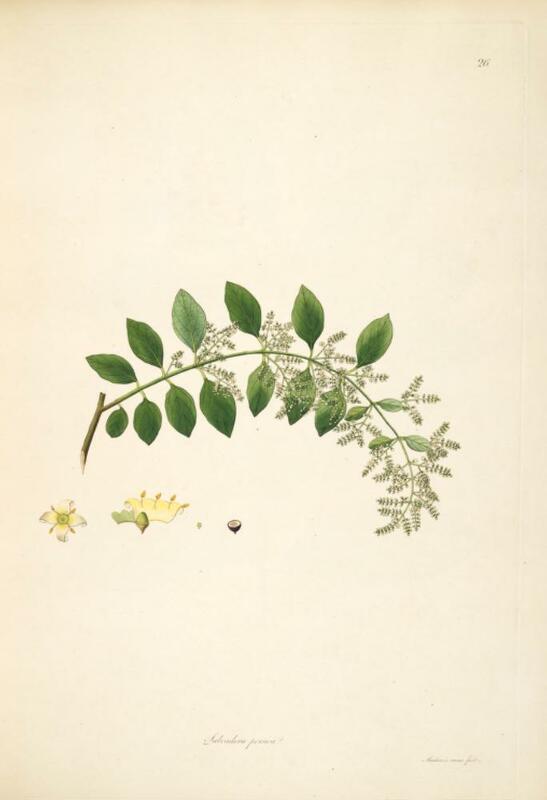 Fol. 1a is blank except for an owner's stamp and signature for al-Sayyid Muhammad ‘Ata’ Allah and one signature for another owner. The catalogue description says that the treatise is a “small tract on the use and the social, physical and religious benefits of the toothbrush (Siwak) was composed by one Muhammad al-Aqkirmani and preserved in a unique copy”. The treatise consists of five parts. The first is about hukm al-siwak, meaning the statements of Shariah concerning it. Among the two main positions (the one is that it is “preferable” to use it and the second that it is Sunnah, meaning a very desirable action to follow what Prophet Muhammad did), the author supports the last one, also provided in the past by well-known Hanafi scholar Yusuf al-Qaduri (d. 1037). When hukm is established, Muhammad al-Aqkirmani goes to the discussion of what Siwak essentially is (aslu-hu). 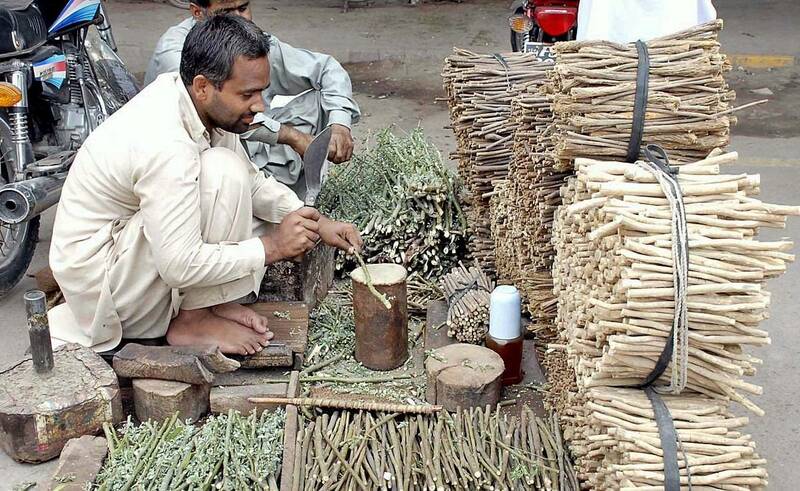 “It is favorable for al-Siwak to be made from some bitter tree which will delete bad breath from the mouth and teeth with a subsequent fragrance, with the only exception of pomegranate and sugarcane”. The author does not explain why it is prohibited to use these trees, but other authorities of Hanafi school (like well-known Ibn ‘Abidin, d. 1784) were explaining that these threes are “harmful for the mouth”. The best one, as continues Muhammad al-Aqkirmani, is arak, because this is the one mentioned in “prophetic medicine” (al-tibb al-nabi). According to Abu Hanifa, says Muhammad al-Aqkirmani, “arak makes the speech eloquent, the appetite stimulated and the brain clear”; similar words are really attributed to Abu Hanifa but the real source of them is not mentioned. For the next two chapters, Muhammad al-Aqkirmani mostly outlines, how to use Siwak and in which places, coming to the idea (after mentioning ahadeeth and saying of the scholars like Kamal al-Din bin al-Hammam, d. 1457) that it is better to use in all the times and not merely before prayers. Going to the last chapter, “Benefits of Siwak”, he counts both spiritual and material sides of it: for example, Siwak discourages the shaytans and attracts the angels, makes the body stronger and the sight powerful. What is interesting here, is that Muhammad al-Aqkirmani discusses the influence of Siwak on the brain, saying that it keeps the mind remembering Islamic creed la ilaha illa Llah (“there is not God but Allah”) before going to die. Thus, Siwak stimulates proper thinking, in contrast to opium, hyoscyamus and hashish. All of them (and first of all, hashish) are prohibited since they divert people from the remembrance of Allah. It may be stated that Muhammad al-Aqkirmani as one of the Islamic scholars from the “Post-Classical Period” of Islamic intellectual history (i.e. between 13th and 18th) addresses the issue of Siwak in two perspectives, the first being legal and the second, medical. Of course, he was not the first one to discuss this issue (many times legal status and benefits of siwak were argued before him), but even his brief contribution seems to be significant. On the one hand, Muhammad al-Aqkirmani could be seen as an Ottoman Sunnah revivalist (being among the followers of so-called Kadizadeli puritan movement), but on the other hand he tended to evaluate Islamic tradition in more rational and pragmatic way, in this case, the medical science. 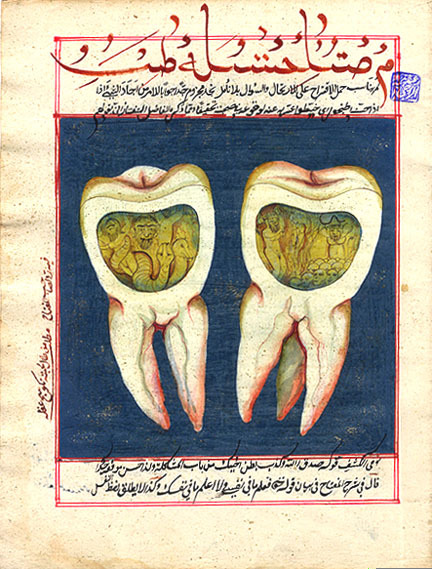 Boss, Gerrit, The miswãk, an aspect of dental care in Islam, Medical History, 1993, Vol. 37, p. 68-79..
 Halawany, Hassan, A review on miswak (Salvadora persica) and its effect on various aspects of oral health, The Saudi Dental Journal, Volume 24, Issue 2, April 2012, p. 63-69. See: Sâkıb Yıldız, Akkirmani, TDV İslâm Ansiklopedisi, Vol. 2 (Ankara: TDV, 1989), p. 270. See analysis: Yakubovych, Mykhaylo M.Muhammad al-Aqkirmânî and his ‘Iqd al-La’âlî: The Reception of Ibn Sînâ in Early Modern Ottoman Empire”, Journal for Ottoman Studies, 2013, Vol. 41, pp. 197-217. See anlysis: H. Toksöz, Muhammed Akkirmânî'nin Ta'rîfâtü'l-fünûn ve menâkıbü'l-musannifîn Adlı Eserinde Felsefî İlimler Algısı, Journal for Ottoman Studies, 2013, Vol. 41, pp. 177-205. Al-Aqkirmani, Muhammad, Risalah fi hukm al-siwak, National Library of Medicine, MS A 19.1, f. 1b-4b. Catalogue: Dietetics and Regimen, https://www.nlm.nih.gov/hmd/arabic/diet3.html. Risalah fi hukm al-siwak, f. 2a. Risalah fi hukm al-siwak, f. 2b. Ibn ‘Abidin, Radd al-Mukhtar ’ala al-Durr al-Mukhtar, Vol. 1 (Riyadh: Dar ‘Alam al-Kutub, 1423/2003), p. 235. Al-Qahtani, Jabeer bin Saleem, Mawsuah Jabeer li-l-Tibb al-Ashshab, Vol. 2 (Riyadh: Maktabah al-‘Ubeykan, 1429/2008), p. 32. Risalah fi hukm al-siwak, f. 4a. Yakubovych, Mykhaylo, Crimean Scholars and the Kadizadeli tradition in 18th Century, Journal of Ottoman Studies, 2017, Vol. 49, pp. 155-171.